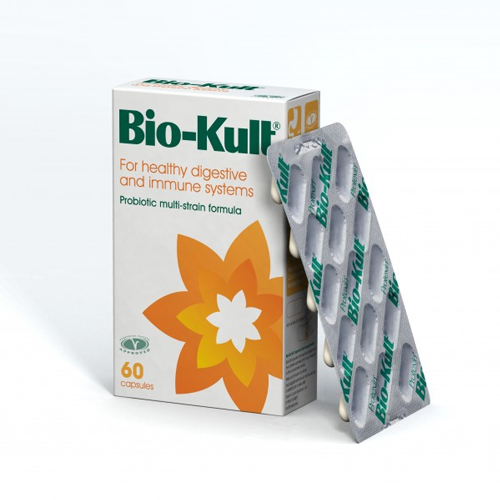 Bio-Kult was formulated by a team of doctors, nutritionists and scientists dedicated to advancing the research and use of probiotic health supplements. The healthy body naturally hosts trillions of beneficial bacteria. Amongst other things, they help to support and maintain a strong immune system and a healthy digestive system. Today's lifestyle of stress and poor nutrition can compromise these essential functions. 1 - 2 capsules twice daily with food. If taking 2 or more capsules daily, divide daily dose in 2. Take four capsules daily, ideally at a different time of day from the antibiotics. If possible begin no later than taking the first antibiotic. Continue taking for at least 2 weeks after completion of the antibiotic course. For under 12s take half the adult dose. Take two capsules daily for one week before travel. Increase to four capsules daily during travel. Continue to take for at least 2 weeks following end of travel. If taking anti-malarials continue for at least 2 weeks after completion of the course. 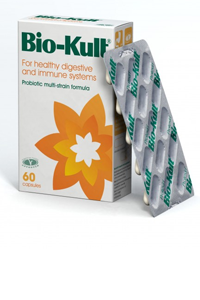 With 14 strains of beneficial bacteria Bio-Kult contains a minimum of 2 billion micro-organisms per capsule.